When people talked about innovation in the '90s, they really meant technology. When people talk about innovation in this decade, they really mean design. Innovation mainly occurs on the levels of processes, products and services, brands and business models. The goal of innovation is to achieve a competitive advantage. The problem of our times is that those advantages won't last long and innovative processes, products and business models can easily be copied or slightly changed as IT tools, tools and services are available to everybody, especially to the emerging markets. Speed has dramatically increased, innovation cycles have become shorter and shorter. In our fast changing world, with its increasing hunger for innovation, an organization using only analytical management practices to enhance efficiency like ERP, CRM and six sigma won't succeed in the market in the long run. Leaders are aware of that missing out on innovation bears a high risk to success. The success of brands and businesses is highly dependent on customer satisfaction, on how their products, services and brands are experienced by the customer. Design is the way to build this bridge to the customer, to discover his needs and wants. Strategic design is a competitive advantage. "You may believe that architects and designers are paid to be creative thinkers, but CEOs, lawyers, and doctors are not. Or you may feel that being creative is a fixed trait, like having brown eyes - either you're born with creative genes, or you are not. We have come to see this set of misconceptions as "the creative myth". It is a myth that far too many people share. This book is about the opposite of that myth. It is about what we call "creative confidence". And at its foundation is the belief, that we are all creative." Now that we have given over our approach to problem solving and our design methods to everyone else, should we do the same with creativity? Is there still a need for Designers? The good news: yes, of course, even more than ever! Creativity is a fluency that develops through practice, that needs techniques and above all a certain playful openness and mindset. It is the sort of mindset, following a passion that draws students to Design School versus Business school. It's a matter of looking at the world around you, of drawing inspiration from anything that crosses your way, of curiosity, of envisioning a picture of the future. The initial phase in idea generation is preparation, scoping out the challenge, conducting primary research, structuring and observing. Followed by incubation, when you tend to feel lost and miserable, unable to find a solution to the problem. Get away from the problem, change your activity – and unconscious associations will happen more freely. So, by going through a 'defined' process with rigor and an open mind toward the end user, you will (eventually) succeed in finding an ideal solution, illumination and spontaneous thoughts may hit you. Followed by validation of the concept and execution. Creativity is strongly connected to playfulness. Take a look at Tim Browns talk at the Ted serious play conference 2008. A secure and inspiring surrounding is key to give individuals freedom to play, to explore and take creative risks. (This is why offices of non-design firms have started to look more and more like design studios, hoping to trigger the employees' creativity). Brainstorming sessions produce better outcomes if you play by the rules (defer judgement and go for quantity), and ideas need to be translated into quick prototypes (a task that sometimes has a playground feeling to it) to get feedback and learn for the next iteration. A good way of prototyping a service is role play, to act it out. It takes courage to be creative, to show precious ideas to others, to share them and to build on them together. It takes time. The advantage of being a designer is the mindset: we are courageous and willing to play. Fortunately, the perception of design in the corporate world has changed to our advantage. Design is no longer looked at as 'styling and color', but as a strategic process to approach the challenges of our times with a broader perspective and multidisciplinary teams. We don't own methods or creativity, but we have broad experience and can use them to our advantage. And as we are entering existing systems as outsiders, we bring in a fresh perspective. Taking a few seminars in Design Thinking wont turn anybody into a designer - just as taking a few business classes won't transform you into a business person. Although it may help to broaden our horizontal stroke and become more T-shaped and thereby valuable team players in the Innovation processes. Designer's contributions to business and society include user-centered design and styling which are important for incremental innovation. How can you discover, what a user really needs and wants – what his unarticulated wishes really are? 'Go out and ask the user!' might not lead to the right answers. If Henry Ford had done this, people would have answered: 'we want faster horses' – but a disruptive innovation like the mass-produced automobile, the smartphone or the digital camera won't come to the world by asking the user. A disruptive innovation exceeds the expectation of the user, it is something people didn't realize they wanted, until they see it. These innovations create new markets for products and services and thereby disrupt existing markets. Design Research gets to the heart of what people value, it is a path to discover those unarticulated needs by critically examining theoretical, historical, philosophical, and social issues related to the field of exploration. Roberto Verganti, professor of the management of innovation at Polytechnic University of Milan. Excerpted from Design-Driven Innovation: Changing the Rules of Competition by Radically Innovating What Things Mean. Harvard Business Press. is intrinsically visionary and built on the researcher's personal culture. The researcher takes on a broader perspective and closely examines evolution and Trends in culture, society and technology. He creates a vision about possible new product meanings that are 'in the air' and that people eventually are just waiting or getting ready for. Our world is changing at high speed: everything is interconnected and complex. It is a human need to keep thinks simple and understandable. This counts for new products and services just as for the collaborative innovation process itself. As the process is not following a stage gate or waterfall structure and has no clear script or check list to follow, the design skills of structuring, visualizing and sharing complex information are a high value for the entire group. Interviews with design thinkers and design thinking coaches of a multinational software corporation, identified 'presentation and documentation' as a crystallized painpoint. 'A lot of ideas get lost', 'shareholders only see the decided upon direction', 'the process is not transparent', 'it's hard to follow up if there has been a break in the process', 'we have no idea if a similar project has happened and what the outcome was', 'it's hard to coach or be involved in the process and at the same time put together a presentation for stakeholders or other groups','post-its with visuals don't digitize well' were some common responses. 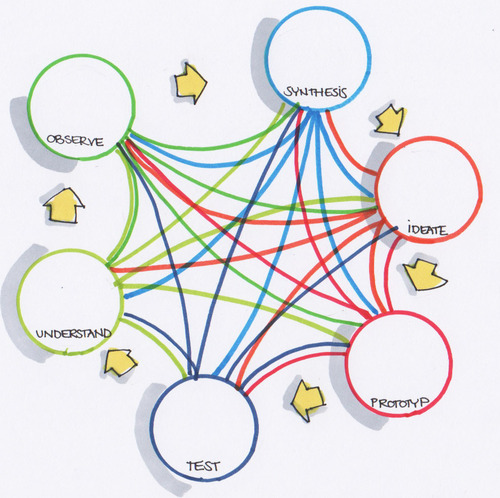 A designer participating in the process can wrap up the most important outcomes of a phase or workshop day in a visual way allowing the group to easily continue or connect to what has been discovered so far - even if there has been one of those 'inevitable breaks' (which are hard to avoid working in a multidisciplinary team). Mindmaps, storyboards or graphic recordings are great tools to document an overview, to make connections between visible dots, to simplify without loosing important content. It's not important to keep every single post-it of a workshop week - they are just tools for thought, but roll out a storyboard and sum up the learnings, insights and ideas in a few minutes and your team and your stakeholders will be well prepared for the next step. Benefit N° three: let’s get visual! "An image is worth a thousand words..."
Visual thinking, the ability to hold a pen and possessing the creative confidence to use it are huge advantages in innovation processes. This especially counts for collaborative, multidisciplinary team processes. As Innovation occurs at the intersection of technology, business and human values, people with very different backgrounds start out to explore unarticulated customer needs together. First of all, the team members need to find a common language, get on the same page, skip the specific terminology used in their field of expertise. At this point, a drawing is a great way to simplify complex matters and bring information to a point to be understood entirely. Throughout the innovation process, the team literally 'develops a picture of the future' together. But most people are afraid to draw. While participating e.g. in a brainstorming session, they put huge amounts of text on their post-its. Their input could be much more effectively shared with a visual. It doesn't matter if the sketch is artistic or looks good, it matters that it communicates an idea, that it sparks an image in the other team members mind, that it opens up room for others to add their ideas. Sketching and rapid visualization lead the team outside the box to the creation of wacky and wild ideas. Our brains are particularly efficient in processing these images, in making fast, associative connections and triggering new thoughts. This way, a sketcher with wild ideas can be an amplifier and accelerator for the ideation process. A good storyboard wraps up the essence of an ideation session. The beneficial use of visuals has become heavily adopted by the business world. As tiring powerpoint presentations eventually (hopefully) slowly die away, new formats like 'demo jams' or 'pecha-kucha' that get to the point fast employ visuals to create a picture it the mind of the audience. 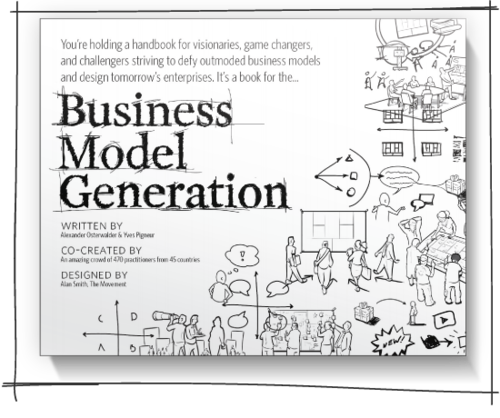 Another well known example is Alexander Osterwalders business model canvas, which makes complicated business subjects accessible by telling a story in a visual way. Same counts for Gijs van Wulferens 'Forth Innovation Expedition'. 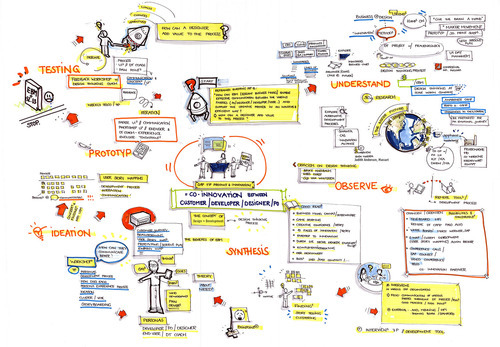 Graphic facilitation, an interactive moderation technique, uses large scale imagery to have the bigger scope of the problem in front of your eyes. It's a group process, where visuals are developed upfront and used during workshops, meetings and conferences to lead the group towards a goal. A shared picture supports a lasting memory in the group. This technique is especially powerful in participatory methods like world cafe or design thinking. And how can you document a day full of brilliant ideas on a million post-its before they will fall of the whiteboard? Graphic recording is a great way to achieve it. 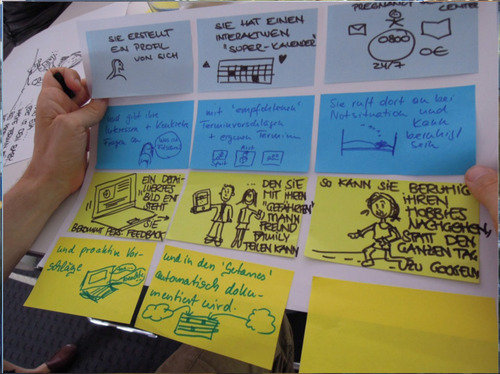 Graphic recorders are usually artists / designers who watch and listen to the participants of a workshop or conference and transcribe the information in a visual manner. It is a visual live-documentation, that captures the talks and discussions, the solutions developed together and helps the team members to keep and understand ideas, questions and solutions and how they are linked. Of course, designers don't own the ability to draw. Recently you can find a lot of seminars on visualization, like the ones from Neuland, teaching business people and developers how to draw (which results in new 'visual codes' from figures to helicopters, that all look very much alike.) But designers do think differently than business people, which can be a great contribution to successful collaboration. While other disciplines successfully employ design tools, designers need to pick up business thinking, to be qualified to act as 'strategic designers' and not to be the ones to make a presentation look sharp and colorful. From what I have observed through my participation in several Design Thinking projects, a multidisciplinary team is a great advantage when it comes to ideation. However, before the team tries to frame the right question, the members need to gain a clear understanding of the customer needs and values. The team must develop empathy for the customer. One of the ways to speed up the process is to utilize structured and shared preliminary design research. This combined with a healthy feedback culture and you will make the most of your team. From Interviews with Design Thinking coaches it became evident, that the fuzziness and ambiguity of the synthesis phase is a critical point in the process. It's the moment when a coach needs to support the team the most to overcome the 'crisis of engagement'. That is, when people become overwhelmed by the amount of data and the process and when the 'uninformed optimism' they started with turns into 'informed pessimism'. I suggest having the designers or a small core team (a sub-group) cluster, frame and share the pile of information in synthesis, and thereby reduce the confusion – because going deep and going fast at the same time is crucial to keep up the energy of the team for the steps to follow. Speed and momentum boost the creativity of the team, which is invaluable in discovering innovative solutions. In this sense speed adds quality. Innovation comes along with uncertainty, there's no clear script to follow. It's a black box out in the future that needs to be defined, envisioned, analyzed, synthesized, iterated, tested and finally launched. You need the appropriate mindset to embrace uncertainty in the midst of the work and to avoid overly simplifying the creative process, which is crucial to every innovation process, in order to stay within the comfort zone. Because the function of design is to create for the future, designers are used to starting from scratch by connecting disparate dots, embracing the vagueness of information and managing ambiguity. Of course, the process of innovating is not a individual endeavor, but a collaborative team effort. At the d.school, a "hub for innovators at Stanford", students and faculty from diverse fields (engineering, medicine, business, law, the humanities, sciences, education) use a methodology for innovation that combines creative and analytical approaches. 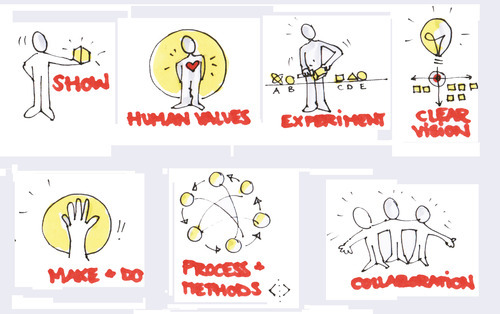 Human values are at the heart of the collaborative approach, which has been called design thinking. Design Thinking draws on methods from engineering and design, and combines them with ideas from the arts, along with tools from the social sciences, and insights from the business world. It is important for design professionals to avoid building design silos while their business and engineering counterparts are slowly starting to tear their silos down. Designers with open minds are great team players in the game of innovation and moreover, their creative and inspiring mindset can be contagious!